Love these Rose Gold Tees for $13.99 (Retail $24.99). These SUPER cute shirts are our favorite! Graphic tees are SO popular these days! 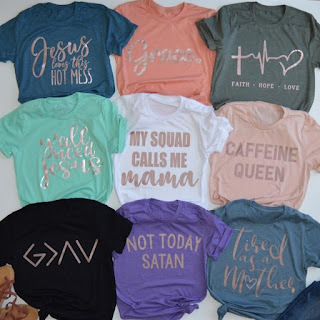 These tees are so cute dressed up or down! Available in FOURTEEN colors and TWENTY-ONE designs so be sure to grab one today. ALL designs are made with ROSE GOLD INK. $3.99 for the first item and $1.99 for each additional item. US only. Ships no later than Tue, May 8.